The Certified Registered Nurse Anesthetist is a certified and registered role. Specialized education programs are established across the country to provide the extra training necessary to be a Nurse Anesthetist. 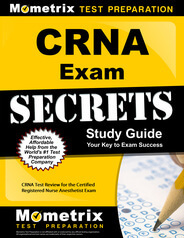 Prepare with our CRNA Study Guide and Practice Questions. Print or eBook. Guaranteed to raise your score. Get started today! The Nurse Anesthetist is responsible for thorough preoperative and postoperative assessment of the patient who is receiving some form of anesthesia. They work in close conjunction with an Anesthesiologist to provide safe anesthesia monitoring during a surgical procedure. In order to take the Certified Registered Nurse Anesthetist Exam, the applicant must be a licensed RN who has completed an accredited Nurse Anesthetist program. There are currently no continuing education hour requirements in order to obtain initial certification. The Certified Registered Nurse Anesthetist Exam is available throughout the year at testing centers across the United States. The fee to take the CRNA test is $700. CRNA Flashcards. 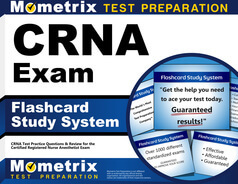 Proven CRNA test flashcards raise your score on the CRNA test. Guaranteed. The Certified Registered Nurse Anesthetist Exam contains a minimum of 100 questions up to 170 questions, 30 of which are for pre-testing purposes for possible inclusion on future CRNA exams. The RN is allotted 3 hours in which to complete the CRNA exam. Approximately one-third of the exam tests the RN’s knowledge on all of the body systems including anatomy and physiology as well as disease states. The remainder of the CRNA exam covers basic principles of anesthesia and the process of administering anesthesia along with possible complications from anesthesia. The CRNA certification is valid for 2 years. At the end of that time period, the licensed RN should have worked the full past 2 years as a Nurse Anesthetist and have completed at least 40 continuing education hours pertaining to anesthesia. Verification must also be provided stating the CRNA does not have any mental or physical limitations that prevent them from being able to administer anesthesia. For more information regarding Certified Registered Nurse Anesthetist certification, go to the American Association of Nurse Anesthetists web page at www.aana.com.